New space research published in the journal Nature, has settled decades of scientific debate. Researchers from the University of California (UCLA) and British Antarctic Survey (BAS) have found the final link between electrons trapped in space and the glow of light from the upper atmosphere known as the diffuse aurora. The research will help us understand 'space weather', with benefits for the satellite, power grid and aviation industries, and how space storms affect the Earth's atmosphere from the top down. Scientists have long understood that the 'diffuse aurora' is caused by electrons striking the upper atmosphere. However, the electrons are normally trapped much higher up in the Earth's magnetic field through a long chain of events starting with the Sun. The problem is to understand how these electrons reach the atmosphere. Since the 1970s scientists have debated whether very low frequency (VLF) radio waves could scatter the trapped electrons into the atmosphere. Two types of VLF waves were identified in space as the possible cause of the 'diffuse aurora', but despite years of argument and research no conclusive result had been possible. The new research shows, without doubt, that VLF waves known as 'chorus' are responsible; so-called since the signals detected by ground-based recording equipment sound like the bird's dawn chorus when played back through a loud speaker. Through detailed analysis of satellite data the authors were able to calculate the effects on the trapped electrons and identify which radio waves were causing the scattering. Lead author Professor Richard Thorne from UCLA says, "The breakthrough came when we realised that the electrons being lost from space to the Earth's atmosphere were leaving a signature, effectively telling a story about how they were being scattered. We could then analyse our satellite data on the two types of VLF waves and by running calculations on them – including the rate at which the electrons were being lost to the Earth's atmosphere – we could clearly see that chorus waves were the cause of the scattering." 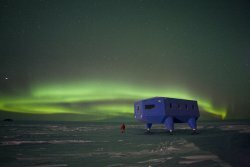 Professor Richard Horne from British Antarctic Survey says, "Our finding is an important one because it will help scientists to understand how the diffuse aurora leads to changes in the chemistry of the Earth's upper atmosphere, including effects on ozone at high altitude, which may affect temperature right through the atmosphere. "We are also including the VLF waves into computer models to help predict 'space weather' which not only affects satellites and power grids, but also the accuracy of GPS navigation and high frequency radio communications with aircraft on polar routes." The 'diffuse aurora', is not the same as the 'discrete aurora' known as the northern and southern lights. 'Discrete aurora' look like fiery moving curtains of colourful light and can be seen by the naked eye, whereas the diffuse aurora is much fainter but more extensive. The 'diffuse aurora', which typically accounts for three-quarters of the energy input into the upper atmosphere at night, varies according to the season and the 11 year solar cycle.